Those good old CBW Permits should be exchanged by buyer and seller BEFORE the buyer ever receives a Radiated Tortoise to ensure that the transaction is lawful unless both are legal residents of the same state. What the buyer may or may not get from the seller upon or after the purchase depends upon the seller's knowledge of the animal. These tortoises are not like dogs registered with the AKC which come with "papers". Some sellers are dealers who are only interested in a quick turnaround on their stock and can never provide any info to the buyer because they do not bother to get it when they acquire their stock or if they do happen to get it, are poor record keepers, and lose it before selling the tortoise(s). Other sellers are more knowledgeable and can supply the buyer with the studbook numbers of their new purchase plus those of its parents, hatch date, incubation data, etc. None of the above (other than the CBW as noted first) are required to be provided by the seller by any government agency or authority, such knowledge of the background of the animal he or she may purchase just makes it more interesting for the buyer. It can also be a good idea to know the bloodlines of animals if one hopes to breed them in the future. If the seller cannot tell the buyer that info, the buyer could unwittingly be buying very closely related animals. 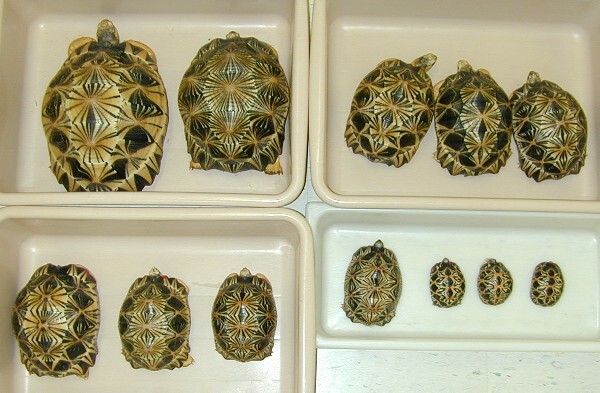 The main thrust of this post is to say that whatever information or records a buyer hopes to have regarding his Radiated Tortoise should be requested from the seller BEFORE the fact, not afterwards.